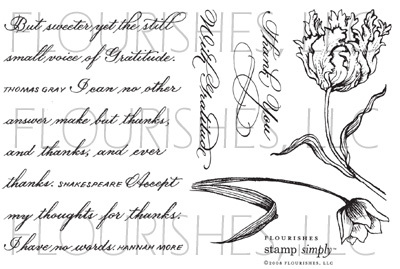 » Stamp Simply #43 – Give Thanks! Stamp Simply #43 – Give Thanks! Keyword ssnotime43 -There is no time limit. You can play this challenge and upload yourproject at Splitcoastand/or your Blog, anytime at all! You (and that means anyone and everyone, blogger or not! )can play as many times as you like!!! The point is to keep it simple, quick and have fun!!! Please link back here. The challenge this week is to make athank you card.I am always out of thank you cards and it’s just nice to have a few on hand. No other rules — just a thank you card. And if you make a really simple one, make 2 or 3 once you’re at it — you’ll thank yourself later when you need them!! Cant wait to see what you doand, as always, try to keep it simple.Most importantly have fun!!! Check out Dee Jacksons sample here. Check out Tammy Hershbergers samplehere. Check out Becky Oehlers sample here. What a fabulous Stamp Simply Team!!! Thank you girls!!! Much appreciated!!! Use black self-adhesive Pearls on her head, antennea and for the dots on the wings. I used various sized Pearls as the dots were of various sizes. Using a Quickie Glue Pen, and working in small sections at a time, color over the black portion and then sprinkle with Dazzling Diamonds or other fine glitter . Tap off excess. Accessories: Black Sheer Ribbon, Black Pearls, Quickie Glue Pen, Dazzling Diamonds Glitter, Rectangle Nestabilities, Petite Oval Nestabilities, Mounting Tape. And here’s a quick look at the full Butterfly Moments set so you can see all it contains. It was designed so there are butterflies that can be used as stand alone images, as well as smaller butterflies for accents on any of your creations. And the scripted Thank You on today’s card came from the latest Stamp Simply release called Thank You. Such a gorgeous and versatile set! And please check out more samples made with our newest releases by the Flourishes Design Team: Leslie Miller, Linda Duke, Faith Hofrichter, Susan Roberts, as well as Nancy Kirk. Remember when you upload to use the keyword above, followed by a comma.Please come back here to post (as a comment) that youve played, and provide a linksowe can check out your card right away. You can find all cards uploaded for this challenge by clicking Gallery Submissions Here. Some wanting to play said they have never uploaded before. If thats you and you need help uploading, just go to my Challenge No. 1 here. Thank you all so much for stopping in. I do so much appreciate it!!! Hope you all have a safe and wonderul weekend!!! And hope you find some time to make a thank you card,or two!! !Have fun!!! Sharon, those black pearls are gorgeous!!!! I thought they were wee tiny brads at first. I LOVE THEM! A beautiful card! BEAUTIFUL card, Sharon! The colors of your butterfly and the style of it just match that Sultry paper so well! Thanks for another fun Stamp Simply week! Just gorgeous Sharon… Have a great weekend. Here is my card for the Simple Thanks challenge. It is extremely simple so it could be put together quickly for a thank you or other occasion. Sharon — this is just gorgeous! I love all the elements! So, striking!! Your butterfly is dramatically stunning! Such wonderful colors and those black pearls are such a beautiful touch! The flourishes stamps just keep getting more and more irresistable! Beautifully done as always. Here’s my simple thank-you card for today’s challenge. Thanks for the opportunity to play along! 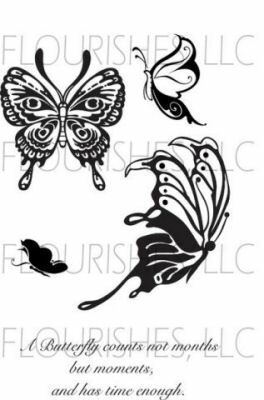 Your new stamp set is beautiful…..I have it on my wish list! This is my first time play your challenge. Sharon your butterfly is completely breath-taking!! I love the dd on the wings. What a gorgeous card! Beautiful card Sharon. I will make sometime today to play along. This is so beautiful! I love the tiny brads inside the wings…gorgeous! Oh my – I am so behind on sending out thank you cards for all of the wonderful things we received when my baby was born – this may just be the kick in the pants I need to get on it!!! Oops forgot to say – LOVE how you did that butterfly!!! Very pretty. Love all the sparkle in the butterfly. Stunning butterfly! 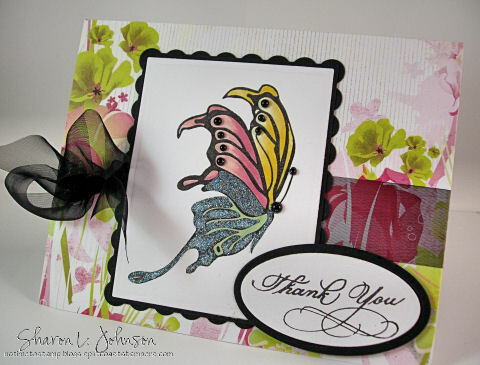 The close up of your card really shows off your great coloring and gorgeous detailing. That butterfly is beautiful coloured and glittered…wow! I’m always in need of thank you cards, so I’m going to do my best to play along this weekend! That is beautiful. The best one yet I’ve seen with that set. I may just have to get it. I purchased the other two, but held off on this one. I knew you were going to do something totally gorgeous with this butterfly and I couldn’t wait to see it! For some reason I couldn’t get on your site last night… I love the way you colored the butterfly and added the glitter and different sized pearls. The garden background is perfect! I love the butterflies in this set and look forward to using them again ASAP. Honestly, I just don’t know which of this month’s sets to reach for first. I love them all!! Thanks for the great challenge & all of your inspiring work!! 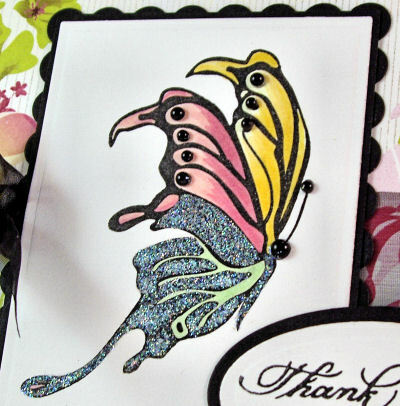 Your butterfly card is so beautiful, and I love your coloring and sparkle!! Beautiful papers too! Hi Sharon! I’m lovin’ those butterflies! All the new releases are gorgeous! I finally got to make my card this evening. 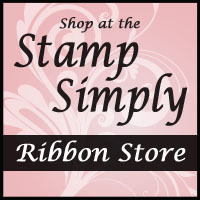 Here it is: http://www.splitcoaststampers.com/gallery/photo/979865?cat=10588. Thanks for helping me stay inspired! This card is just beautifully coordinated – from the background paper to the dazzling diamonds – it just comes together perfectly! and LOVE the use of the black pearls. had to go in and buy oodles! Thanks, Sharon, for another great challenge! I always need Thank You cards – thanks for the push to make one! Your sample is stunning! I love the new images! All the other samples are gorgeous, too! Fantastic Sharon, I’m so happy I had a chance to play this week! Love your card, Sharon!! The butterfly stamp is just beautiful! Thanks for another fun challenge, Sharon! I am stamping again and I created a Thank you card. Right on time… as usual !!!! I am always in need of thank you cards! So this was really easy and necessary for me! It will go out in the mail tomorrow. I only hope that the person it is destined for sees it in her mailbox before SCS or my blog!